Computer software and its structures, devices and processes are woven into our everyday life. Their significance is not just technical: the algorithms, programming languages, abstractions and metadata that millions of people rely on every day have far-reaching implications for the way we understand the underlying dynamics of contemporary societies. 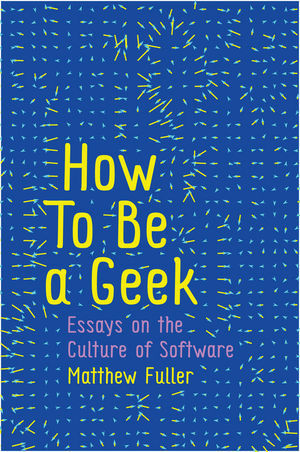 In so doing Fuller shows that everyone must learn ‘how to be a geek’, as the seemingly opaque processes and structures of modern computer and software technology have a significance that no-one can afford to ignore. This powerful and engaging book will be of interest to everyone interested in a critical understanding of the political and cultural ramifications of digital media and computing in the modern world. "Insightful, informative, provocative and brilliant, Fuller 'geeks out' the problematic of software. In a wide–ranging analysis that moves from object oriented languages to github, from metadata to urban models, Fuller reveals software's intersecting technical, cultural and political aspects. A must read for anyone interested in software and new media studies." "This new book from the pioneer of software studies sets a new standard for critical discussion about the crucial part of contemporary culture and society – software. From mobile apps and social networks to email and word processing, we use software everyday. Yet critical thinking about software that can combine big ideas with careful attention to small details and genealogies of software concepts, tools, and interfaces is still rare. Fuller and his collaborators both give us fresh ideas and wonderful insights, and also show us what it means to study software culture."